It's nice to see that something like this actually exists, if all the oil in the world dries up, we'll still be able to get around! 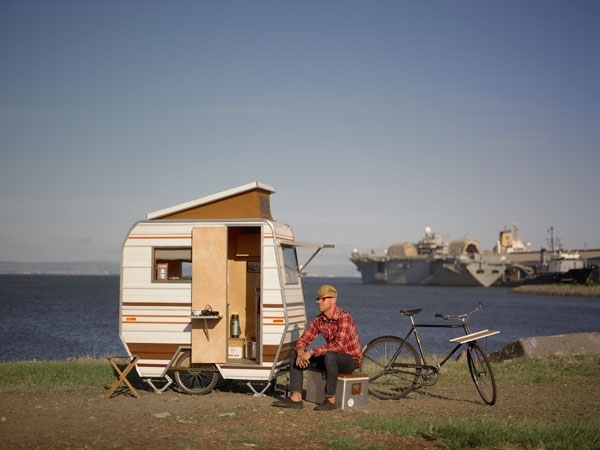 Even more incredible is that this unit sleeps 2! 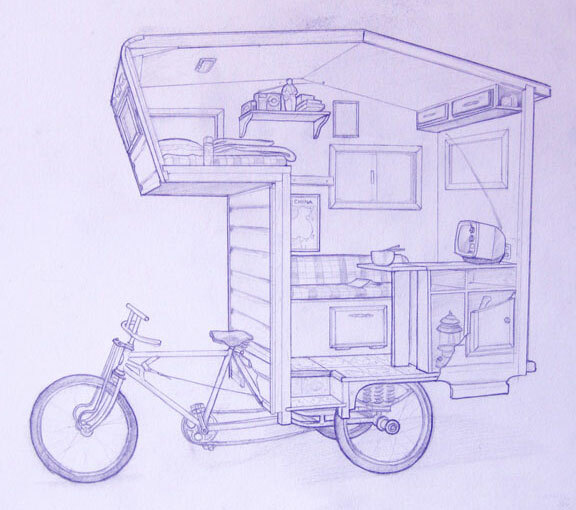 (Although I imagine one would be a bit cramped for leg room on either the couch or bed loft. There’s a sense of freedom to be found in loading up your RV with all you need to survive and hitting the road to explore new places and commune with nature. This RV does it a little differently – as you’ll notice it’s completely human powered, about half the size of a normal cab-over camper, and it’s completely emission free. 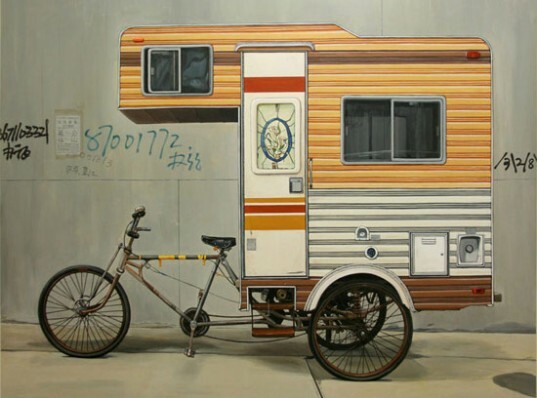 Designed by Boston-based artist Kevin Cyr, the Camper Bike is both a fully functioning RV and the subject of a number of Cyr’s amazing paintings. 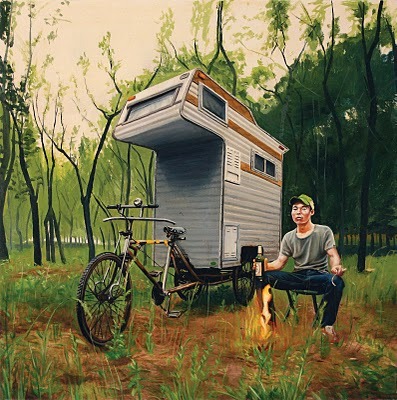 kevin cyr: the idea came to me during my first trip to China a couple years ago. I had the opportunity to assist a New York artist on a painting project in Beijing and I absolutely fell in love with the culture, the people, the food and the different modes of transportation. 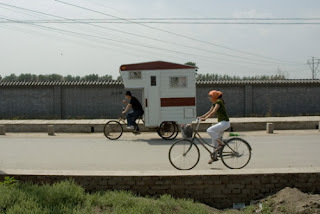 Beijing has a huge bike culture and for most people it's their only way of getting around and how some make a living. I saw so many people using pedal bikes, mopeds, and 3-wheel scooters for really labor-intensive work and carrying huge loads, much like pickups are used in the U.S. 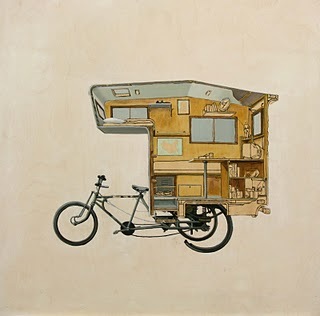 I've always been interested in bikes, motorcycles and painting cars was my way of documenting the changes in the U.S. through our car culture. traveling abroad has exposed me to vehicles that I never knew existed and has also provided insight into different cultures. I think you can tell a lot about a place by the types of vehicles people drive - like the rickshaw in India and the 3-wheel bikes in China. 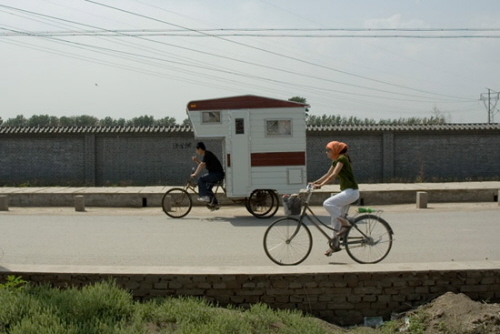 Until I built a camper last month in Beijing, it didn't exist. I guess it's a little different from my other paintings, because I'm no longer documenting a particular kind of vehicle, but creating my own. 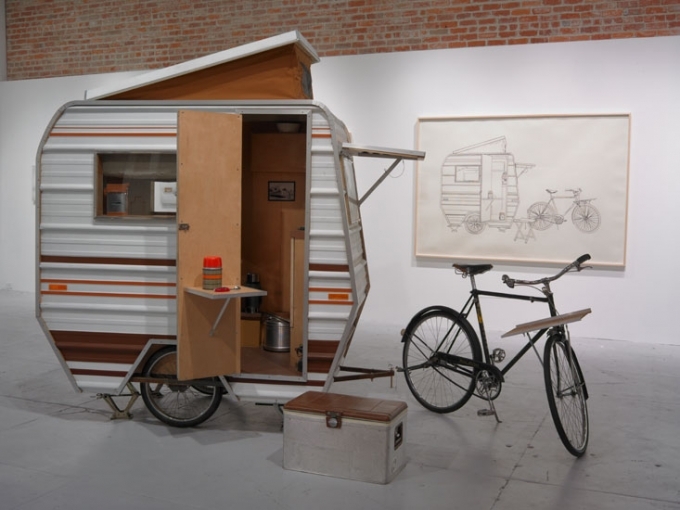 It became a social interest when I realized the cultural differences in regards to recreation. I grew up camping, but the idea of sleeping in the woods is completely abstract to most. 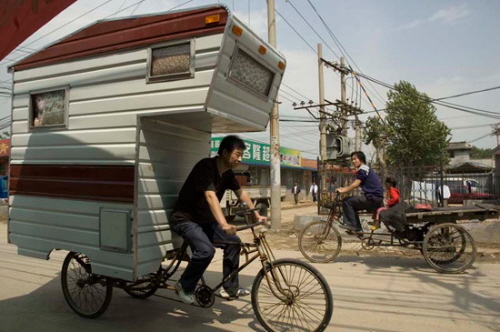 few people I met in Beijing had ever heard of an RV/camper much less seen one in person. Until now, I've thought of my project only in the context of China, about placing such an American object on something very specific to China. 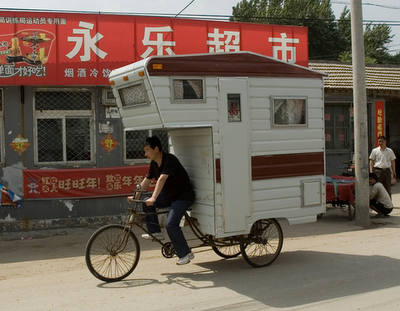 It's interesting to be how Chinese people react to the camper, until now they've only been exposed to luxury products, or brands from the U.S. I'd like to think that I'm doing something a little different with the camper. I've shied away from making it an environmental issue, flying to China and back is the worst thing I can do to the environment, so I'm not the one to say anything, but as our economy worsens and gas prices sky rocket my project does become more relevant in the U.S.
Kevin Cyr has his own gallery showing now of his energy crisis trancending vehicles the link is here. Can you imagine riding one of those and turning the corner to see a mountain climb? I would have the best calves ever! 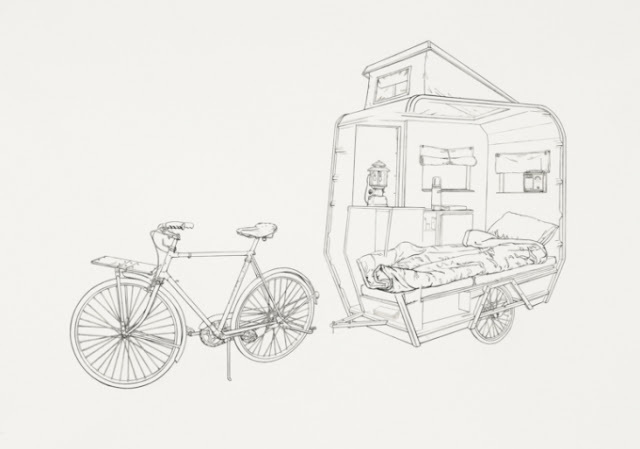 We are trying to raise funds through our indieGoGo campaign to actually make a prototype hopefully in time for spring 2013. If we can get support from enough people in the cycling community then we can actually take our project to the next level which will be production. We already have some dealerships that are very interested in our product. What's the purpose of this Mister Hipster? You can't lay down in it. Can't stand in it. From the looks of it, you can't sit in it. Can you even get in the tiny door? Yes, the mountain view would be scary. I ride a Schwinn Meridian adult tricycle here in Kentucky. The solution to the problem would be to add one of the front-wheel mounted electric motors and it would pull just about any hill you came to. It would also add only a couple hundred dollars to the total cost. Happy trails. I guess solar power and an electric auto-assist bike would come in handiest.